The Charleston Navy Base was established in 1901 on the former site of Chicora Park. The park was owned by the City of Charleston and had been designed by the Olmsted Brothers just five years earlier, in 1896. 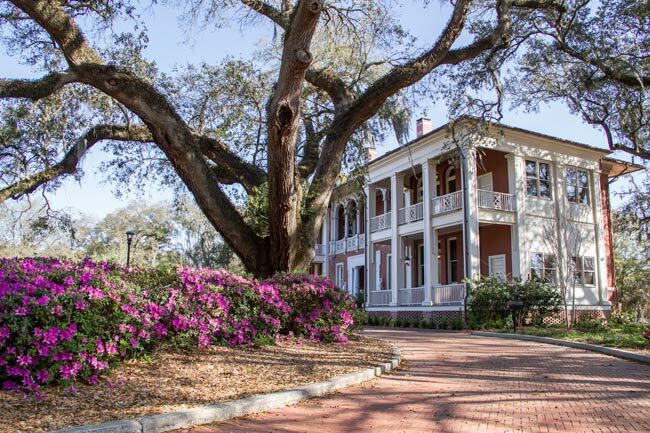 Situated in present-day North Charleston, the base’s Historic Officers’ Quarters District retains stunning examples of early twentieth century architecture. 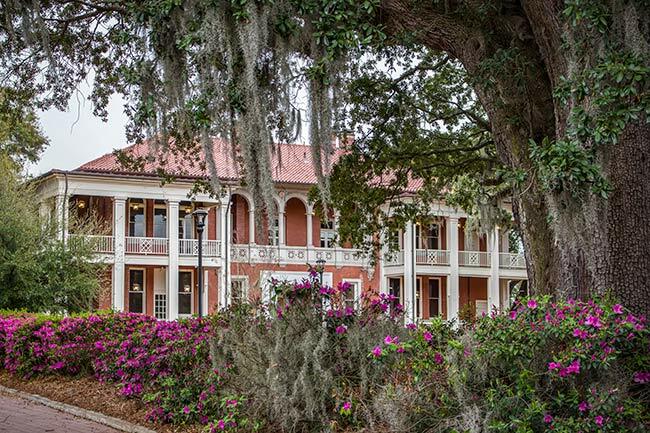 The Renaissance Revival structure known as Quarters H-I was built in 1905 to house the offices of the Commandant and his staff, as well as the Captain of the Yard. It is unusual in that it is built of brick. Most other structures in the district were constructed of wood. Quarters H-I was intentionally built near the Commandant’s – or Admiral’s – house, known as Quarters A. However, by 1912 plans were underway to relocate the Commandant’s Headquarters to a site within the Navy Yard’s industrial complex. The industrial complex features the notable Central Power Plant. The former administrative building was converted into a duplex residence for senior officers in 1913. Architectural details of the 8,000-square-foot structure include a terra cotta tiled roof and 17-inch-thick brick walls. Porches were added in 1919, and in 1933, a rear addition was built. Quarters H-I sat vacant for years following the announcement of the closing of the Charleston Navy Base in 1993. It was then owned by the South Carolina Department of Commerce as part of its Palmetto Railways project, which focuses on building an intermodal terminal at the former base. While that plan is still active, its location has shifted, and the City of North Charleston now owns many of the former officers’ quarters, including Quarters H-I. Restoration efforts on Quarters H-I began in 2011 and continued through 2014. The roof was repaired, wheelchair accessibility was added, and many features were replaced. Today the building is used as the headquarters for the Charleston Naval Complex Redevelopment Authority. The old Quarters H-I building stands prominently over one of North Charleston’s fasting growing attractions, Riverfront Park. The park features outdoor recreational activities, cultural and family friendly events, festivals and more. Quarters H-I (1905), 98 (H) and 96 (I) Navy Way: Two–story Italian Renaissance Revival style, rectangular plan building, with a clay tile hipped roof penetrated by four interior brick chimneys, carved wood rafter tails with wide overhanging eaves. Solid seventeen inch-thick brick walls with two inch-thick interior hollow terra cotta tile and plaster interior, concrete foundation. Granite stair entry to distyle in antis porch is at the west elevation’s center and is flanked by two one-over-one wood sash windows. Second floor retains five-bay arcaded loggia with pierced stone balustrade, columns and arches with roundel-ornamented spandrels. Wood porches constructed in 1919 wrap from the two outside front bays around the end elevations providing two level porches, hip roofs, later infilled for additional interior square footage. A rear two-story brick addition with flat roof extended the building. Exterior fenestration grouped in one and three sash arrangements, first level one-over-one light sash on granite stringcourse and water table, second floor one-over-one with semicircular transom with radiating brick voussoir arch. Quarters H-I was designed in 1903 and completed in 1905 as the Administration Headquarters building for the offices of the Commandant, his staff and for the Captain of the Yard. Its design is an excellent example of American eclectic architectural in the Beaux Arts tradition with Italian Renaissance Revival detailing. The building’s Italian Renaissance Revival design is a style more frequently chosen for civic buildings, which was appropriate for its original use as the Commandant’s Headquarters. The building’s recessed entry vestibule, second floor loggia, clay tile hipped roof, wide eaves with exposed decorative rafters, and round-arched windows are characteristic of this early twentieth century style. 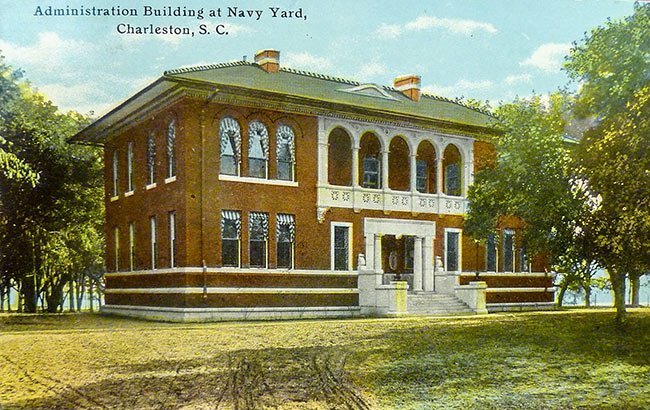 It was typical during the early twentieth century in the Navy’s planning protocol for the Yard to construct the Commandant’s Headquarters in close proximity to the Commandant’s Quarters, which was always Quarters A at the Charleston Navy Yard. Its construction site, therefore, was slated to be just east of the old Turnbull Mansion that had been razed (ca. 1904), one hilltop from the planned location for Quarters A. When constructed the monumental entrance façade faced west with a smaller rear entrance facing east and out toward the Commandant’s Pier. The physical site took advantage of the vista to the Cooper River that had been laid out in the original Olmsted Chicora Park plan as its primary landscape axis to the River. At the same time a large flagpole was placed in the entryway drive’s forecourt, terminating the axis from the Cooper River just to the west of the Commandant’s Headquarters and designating the building as the central command for the Charleston Navy Yard. As constructed, the building’s rectangular two-story dimensions were thirty-nine feet by eighty feet with a heavy concrete foundation and seventeen inch thick brick exterior walls with two inch-thick hollow terra cotta tile interior walls faced with plaster. 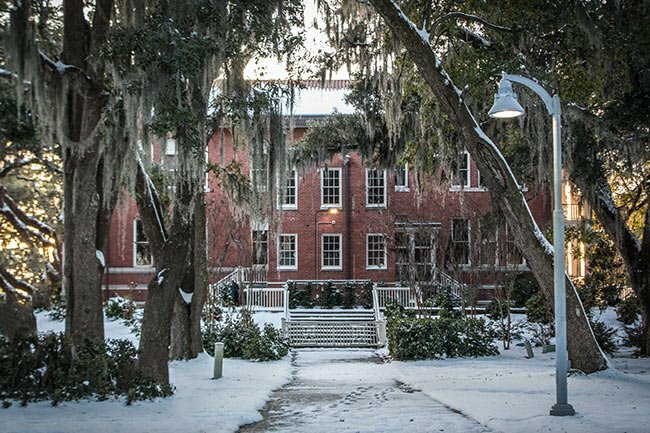 As the most important institutional building built during the first decade of the Charleston Navy Yard’s initial development, its design utilized the richest materials used at the Yard. As early as 1912, however, plans were drawn to convert the offices into a townhouse-plan residential duplex for senior officers. The Commandant’s Headquarters was to move to within the core of the adjacent industrial Charleston Navy Yard District. The residential duplex plan changes were carried out over the next year. The duplex presently has 8,205 square feet on two levels. Two story wood porches in the tradition of the other Officers’ Quarters were added in 1919 to the front and side façades. 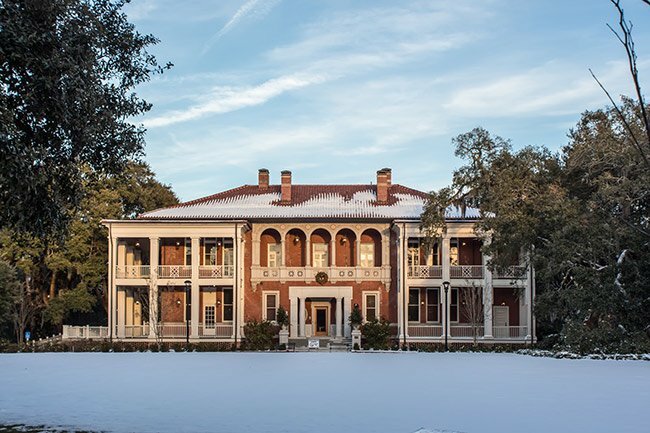 They were designed to wrap around the northwest and southwest elevations as porches, covering the original west fenestration and two bays of windows on the north and south elevations. In 1929 several bays of the 1919 porches were enclosed for additional interior space with six-over-six wood sash and in 1933 the second floor front loggia arches for Quarters I were enclosed. 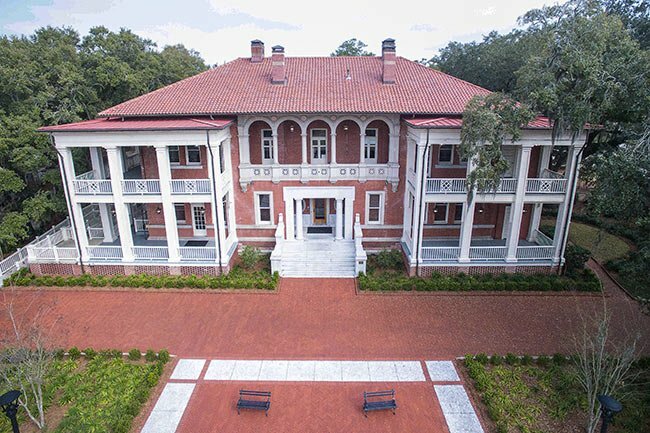 In 1936, the original rear entry facing the Cooper River was demolished and a two-story residential brick addition was added with a one-story side rear entry porch for Quarters H and a straight stair and rear entry for Quarters I. 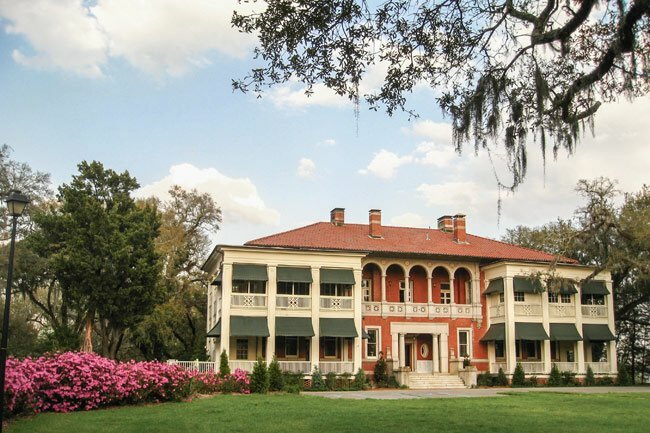 An original Ludowici red pan tiled hipped roof covers the central mass of the building, with slightly pitched hip roofs covering the two front flanking porches added in 1919. The 1933 rear addition has a lower flat built-up roof behind a small raised parapet. Four brick interior chimneys rise from the roof. The two chimneys centrally located at the ridge of the hipped roof have granite caps and recessed panels, and are original. The two chimneys along the west slope of the roof were added in 1912. The underside of the wide projecting eave features recessed panels and elaborately decorative exposed rafters tails. At the primary west façade, a centrally located granite stairway leads to a recessed entry vestibule or porch that is surrounded by a Grecian classical motif with a trabeated frame of cut granite with two granite columns in antis. The entry stair is framed by large, stepped granite cheek walls that are capped with slabs of granite. The cheek wall caps terminate at the brick surface of the building with an ornate carved stone acanthus-leaf bracket that is raised vertically against the facade, as with a buttress. On either side of the entry stair is a single one-over-one double hung wood sash window with a granite surround that rests on a projecting granite stringcourse. The two windows were originally faced with ornate wrought iron grilles. Below the stringcourse at the building’s foundation is a double-tiered water table of brick with a granite base and cap that run around the entire building. The floor of the recessed entry vestibule or porch has mosaic marble tile and the interior walls have marble wainscoting. A single wooden full-light door with beveled leaded glass is centered in the vestibule and serves as the primary entry to Quarters I. The doorway has egg and dart detailing and is flanked on either side by an oval-shaped cameo window with decorative stone garland surround. At the north interior wall of the vestibule a doorway was cut in 1912 as the main entry to Quarters H.
At the second level above the recessed entry porch or vestibule the façade is enhanced by a loggia of five granite Italian Renaissance Revival arches supported by stone columns and plinths. The marble plinths are part of a continuous stone balustrade that is pierced with geometric classical Roman motifs. The design is a series of cross and diagonal rails. In the spandrels of the arcade are four circular stone marble medallions in the Florentine manner. Decorative copper drain spouts project for drainage. 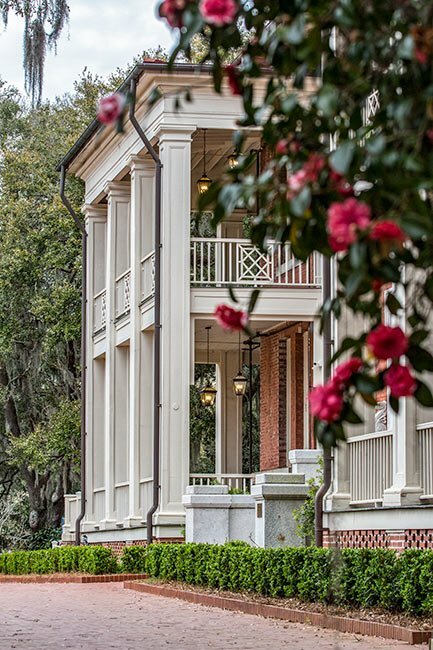 The two wooden porches added in 1919 at the front corners of the building are supported by full height two-story square paneled piers that have full classical wood entablatures. At the sides and rear of the building, one-over-one light double hung wood sash appear at the first level above the continuous projecting granite stringcourse. At the second level there are corresponding one-over-one wood sash with granite sills. They have arched circle-head transoms that are surrounded by slightly projecting voussoir arches of radiating brick. The fenestration is symmetrical with windows appearing singly and in groups of three along the rear and side elevations. Dentils and egg and dart details decorate the cornice of the building. The building has received only minor alterations since 1936 due to routine maintenance. Since 1996, the North Charleston Redevelopment Authority has removed the infill from the front elevation’s second floor loggia and has added a brick and concrete handicapped-access ramp with a wood railing at the north elevation. One of the side screen bays of Quarters H was made into an entry door for the ramp. The Quarters retain much of the building’s original architectural character in their interior detail; while vacant, they are in fair condition. My high school classmate lived here with his family prior to his father’s naval retirement. It is wonderful to see and hear the history and restoration of this beautiful home!